I had been living in Melbourne for nearly six years by then, long eligible to apply for citizenship. When so many people would envy this privilege, why did I not jump at the chance as soon as I could? It was because I was still feeling caught in an imaginary homeland. Salman Rushdie refers to this peculiar space in which migrants dwell, where they no longer feel entirely at home in their native land yet remain somewhat an outsider in their adopted one. It is not an easy landscape to navigate. Certain things made it harder for me. I arrived in December 2000. The following year, a Pakistani refugee self-immolated in front of Parliament after his application for his family was rejected. A Norwegian freighter was refused entry after rescuing hundreds of Afghans in international waters. Not long after this, asylum seekers were accused of throwing children overboard. It was also the year when two planes slammed into the World Trade Centre in New York. The seismic waves spread outward. In broad daylight on an inner Melbourne street, a woman had her hijab yanked off her head by a stranger. Such tensions erupted a few years later on the beach of Cronulla. These events had nothing to do with me, but I absorbed them. I am brown-skinned. Though not a Muslim, I have an Arabic name. Most of all, I was not born here. I was eligible for citizenship, and on some level desired it, but was equally certain that it would be no protection against somebody on the street who decides that I do not belong. The political language at the time did nothing to invalidate such views. Thus, my initial vision of a sun-dappled, enlightened country was replaced by shadow. It darkened further in my readings about the Stolen Generations and the conditions in which many Indigenous Australians live. I encountered the urban poverty that lay hidden. I grappled with these things as I made a life for myself. I got married, worked for youth organisations, gained a teaching qualification, and started teaching at a state school. Yet it became impossible to remain detached for long. As a teacher, I became conscious of my role as a conduit between my students' suburb and the rest of the world. I wondered about their future. Then I became a mother and worried about my son's. I attended rallies, convinced I also had a stake in the issue. I started caring about what we stood for as a nation and how we fit into the international community. In other words, my perspective shifted from the outside looking in, to inside looking out. My sense of injustice shifted from a broad, humanist understanding to a parochial concern: Australia could be better than this. We should be better people. In the end, I decided to apply for Australian citizenship as a matter of authenticity. I could no longer pretend the shame I feel over the gap between Indigenous and non-Indigenous Australians is the shame of an outsider. I could no longer pretend that the anger I feel over the treatment of asylum seekers comes from an observer. The moment I felt that the government was accountable to me on these matters, was the moment I realised that I needed to be able to vote. To have my voice amplified by the ballot box. My journey to citizenship had to happen this way. I take both the light and the dark, and walk forward in full. Fatima Measham is a Melbourne-based writer. Her application for citizenship has been approved and she is waiting to make the pledge. She blogs and tweets. Thank you for this piece Fatima. You are already are a wonderful addition to our Australian family. Fatima, even we "older" children of convicts battle the same issues and frustrations, but would not live in any other country. Thank you Fatima for your article's clearly enunciated and touching disclosures . For better or worse : Welcome ! But will Fatima take the Oath, or the civil declaration? 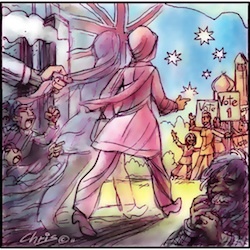 There are plenty of Australians still umbilically linked to God, Queen and Kensington while others wistfully hope for a genuine secular democratic republic, free of gods and sovereigns, or even pretend sovereigns in the form of job-shifted GGs. Those hoping to adopt a 'new' country might wish to think carefully about how they adopt the nation as 'theirs', within the tired old framework, or by declining the Oath, and going for freedom and change. Australia as a 'nation' is still but a concept, even if it's place as a nation-state is well recognised. 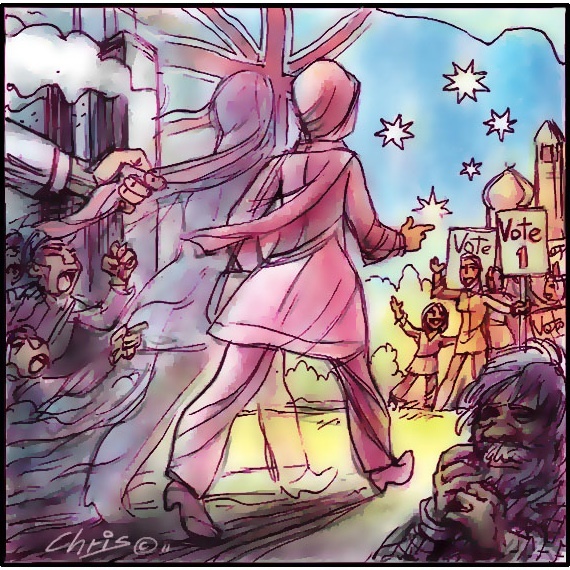 This first step into 'Australianhood' Fatima is taking is as much a political choice as anything else in life is. Choose with care and thought, Fatima. Fatima, I am proud to have you as a fellow Australian. My ancestors came from Britain, but had no greater right than you to call this country "home". We are all pilgrims though this world, and can all try to make it better by our being here. I am an Australian, born and bred here. I can't claim to have an Irish, English, French or any other background. As far back in my family as I can go, we are all Australian born. Australia is the greatest country in the world. In Australia all of those who wish to gripe about anything can do so. In some peoples' eyes I am the worst sort of life that can inhabit our country. I am a white male and to compound this horror, I am a true Catholic! Why do so many want to whinge all the time? If you don't like it, go to the country of your choice that best represents your preferred point of view. If you want to improve Australia, pray for the Social Reign Of Our Lord, Jesus Christ to rule over the affairs of Australia! Citizenship is a bit like baptism - you might not have a say in it and you might not always be proud of the authorities or constiution, but it is part of who you are. I did not choose to be Australia nor Catholic, but as a rational being I see the good and bad in both entities. Even as someone who has chosen citizenship, Fatima, from reading your article I think you would admit that Australia has also equally chosen you. We have bigots and racists in every country. If you travel around the world and open your eyes, you will find that Australia is a far more open and tolerant country then most. Every migrant to Australia would have had some unpleasant experiences. I can recall when at an ANZAC day a news agent refused to serve me in the belief that I was German. So what, we just have to ignore and laugh of bigots and small minded people. Thank you very much Fatima, for your article, which helps me to understand a little more about the way some of our more recently arrived citizens think and feel. You have so much to give a to your students and I,m sure you do so. I'm pleased that you have now received citizenship. It is good for Australians to remember that for most of our country's history there were no Australian citizens. In fact no-one has been an Australian Citizen longer than I.Administratively I became one through the Nationality and Citizenship Act of 1948.Even then my Nationality remained British and, even though the Act was amended in 1969 and was renamed the Citizenship Act, we Aussies remained British Subjects -- as my passports bear witness -- until 1984. Thanks, Fatima. My parents chose to have me "naturalised" (as it was referred to then) and I have always been very happy they did. I'm sure you too will not regret your decision. Thank you Fatima for your beautiful and honest article. I feel honoured as a citizen that you have chosen to be an Australian We need more of you! A thoughtful way to become and be a citizen. Thank you. Thank you for the welcoming comments. I feel humbled and encouraged. Harry, it is indeed a political decision, as much a personal one. But then I've always taken politics personally. I'm disappointed by suggestions that I am 'whinge-ing', that I should see Australia as essentially better than most other countries. I have no difficulty conceding this point in specific areas such as the provision of social welfare and cultural freedoms. What I intended to illustrate was that the choice to become a citizen, as well as behaving like one, involves clear-eyed engagement with all aspects of civics. A soft toy. A restaurant menu. A business card. An agony so great it swamped the world. While America was busy hunting down Osama bin Laden, my son and his contemporaries, who were children at the time of the attack, grew up and inherited a world irrevocably changed.